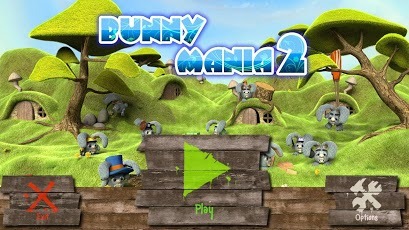 Bunny Mania 2 is a very fun and engaging app that has you setting out on an adventure through a world of great challenges, where using your bunny characters, you need to find the best way to finish up the level by reaching to their hut. There are over 60 levels you can indulge into and they span over snowy peaks and all the way to summery green fields, also deep undergrounds. This is a classic puzzle game you don’t want to miss and because it features HD graphics, it will look stunning on your android tablet or phone. You’re in charge of several bunnies and each of them can help you reach the hut as soon as possible. You can collect vegetables, drill holes and build bridges that will help you complete the level and move on to the next one. There are a total of 10 tools, crates powerups you can use during the game, all of them helping you in their very own way to make reaching your goal much easier. Are you lost and don’t know where to go? Don’t worry about it, because the advanced hint system will precisely guide you through the game. If you loved the experience of commanding the bunnies and reaching your goals, you might be interested in getting the full version which contains no ads. There are several languages supported and they include English, Japanese, Korean, Spanish and German. There are plenty of improvements the app has gone through to make it feel more responsive, crash free and more fluent while playing it. On top of that, with version 1.0.9 the first language package arrived, meaning more people can enjoy the game in their native language. 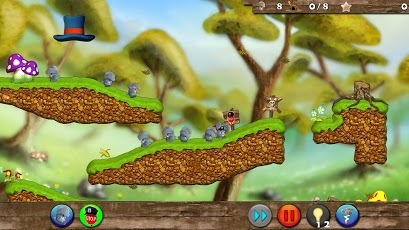 With an easy control system, fun gameplay and crisp HD graphics, Bunny Mania 2 is the successful precursor of the highly acclaimed Bunny Mania 1 and it seems that it managed to stretch the fun factor and addictiveness of the first title to new and exciting levels that’ll make you absolutely love it!